A note on this post: I will be discussing the details to the solution of a problem that was solved by a co-worker of mine. See his blog, The Devel. I can see versions of this problem (described below) coming up in other domains. I am going to walk through the solution in this post, from the most naive implementation up through a single query that solves the entire problem. Hopefully it will be a relatable guide to using some of SQL's interesting features. I am also posting a sample SQLite database that you can download and play with while working through the post. If you are not familiar with SQLite, it is a simple, server-less SQL database. It is very widely used and often embedded within other products (it might be running in your web browser). It is perfect for learning SQL because there is virtually no setup and it is almost impossible to break anything. you will be at a SQL prompt ready to go. They have not yet reviewed. Has only been reviewed by at most N other reviewers. Of the movies that fit criteria 1 and 2, each movie is just as likely to be assigned. In summary, if we take N to be 1, you just want every movie to be reviewed by 1 reviewer, and you want every movie to have an equal chance of being reviewed. Do a select on the reviews table for all reviews by Sleepy. Do a select on the movies table, selecting all movies whose ids are not in the list created in step 1. Iterate through the list of movies from step 2, querying the review table for reviews for that movie. Then choose (at random) a movie whose number of reviews is < N.
Then generate a SQL query on the movies table to grab all the movies Sleepy has not yet reviewed. Finally, iterate through each movie returned in the previous query, constructing a query to count the number of reviews for that movie. Shawshank had no reviews, The Dark Knight had 1 review, Goodfellas had 2 reviews, and Casablanca had no reviews. If N was equal to 1, randomly choose between Shawshank and Casablanca, assigning one of them to Sleepy. All done! We now know the names of the movies that Sleepy has not reviewed. We could now just do step 3 above, iterating through each movie to find out how many reviews we have for each one. For clarity's sake, I will use the more explicit syntax from here on out. Let's join these two tables. Just look this over for a second and it should become clear that the M and R following the table names are aliases. Everywhere else in the query that alias is used to refer to its associated table name. You will probably see this used in the SQL wild. We now have one row for each movie not reviewed by Sleepy. We could almost solve this problem now without hitting the database again except for the fact that we don't have any information about movies that have no reviews. From here we could do a SELECT * on the movies table, and we would have enough information to programatically figure out what movie to assign Sleepy. The results are exactly the same as above except that we have a row for Shawshank and Casablanca with no corresponding reviewer. We now have enough information to programatically find a movie for Sleepy to review. Can we make the database do that too? 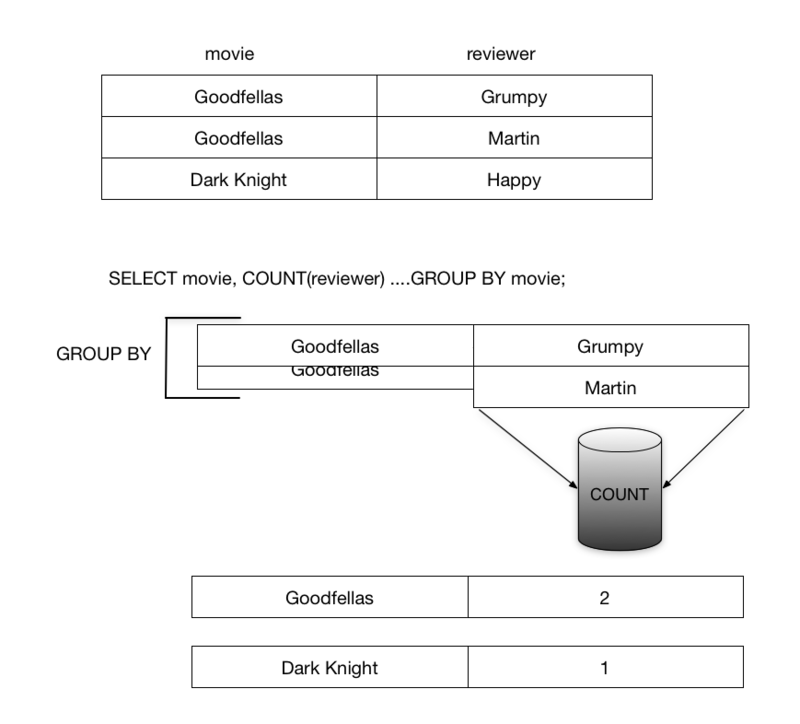 We can use COUNT, GROUP BY, HAVING, ORDER BY, and a database dependent RANDOM() function to have the database return just the name of a movie Sleepy should review. Lets throw COUNT and GROUP BY in there. GROUP BY works by rolling up all identical values of fields after your SELECT statement, aside from variables inside aggregate functions (which COUNT is), into a single row. So instead of getting one row per movie review as before, we are getting one row per unique movie, and the corresponding reviewer variable has been converted into a count of the number of reviewers associated with each row that was grouped. GROUP BY can be confusing, in particular because depending on which fields you put after your SELECT statement and your GROUP BY clause, the results might not make any sense. The general rule is that any field coming after your SELECT statement that is not in an aggregate function (a function that takes many values and outputs one, like COUNT and SUM) must be in your GROUP BY clause as well, otherwise it either will not work, or the meaning of the query is not well defined. GROUP BY really could be its own post (and I am sure it is elsewhere). But we still don't have the database answering this question for us. Lets move that COUNT variable into a HAVING clause. For this problem though, we definitely need the check to be in the HAVING clause, because the value of the COUNT aggregate function will not yet be defined in the WHERE clause. At the point in time the WHERE clause is being executed the database is still determining which rows are actually in our results and correspondingly, which rows the GROUP BY will be performed on. The HAVING clause allows us to perform checks on the grouped rows. Any corrections or alternative solutions?